← Where, O Death, Is Thy Sting? Jesus said, “Then the kingdom of heaven will be like this. Ten bridesmaids took their lamps and went to meet the bridegroom. Five of them were foolish, and five were wise. When the foolish took their lamps, they took no oil with them; but the wise took flasks of oil with their lamps. As the bridegroom was delayed, all of them became drowsy and slept. But at midnight there was a shout, `Look! 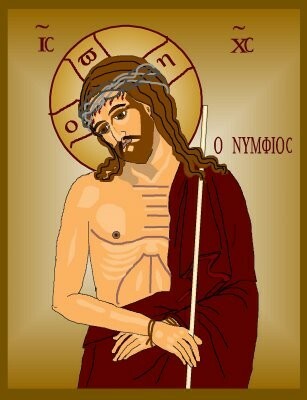 Here is the bridegroom! Come out to meet him.’ Then all those bridesmaids got up and trimmed their lamps. The foolish said to the wise, `Give us some of your oil, for our lamps are going out.’ But the wise replied, `No! there will not be enough for you and for us; you had better go to the dealers and buy some for yourselves.’ And while they went to buy it, the bridegroom came, and those who were ready went with him into the wedding banquet; and the door was shut. Later the other bridesmaids came also, saying, `Lord, lord, open to us.’ But he replied, `Truly I tell you, I do not know you.’ Keep awake therefore, for you know neither the day nor the hour.” Matt. 25:1-13. In the Lectionary today, we encounter the Parable of the Bridegroom. The parable sounds a well-known warning to us: “Keep awake therefore, for you know neither the day nor the hour.” While Jesus is teaching us about the need for preparation, I think he’s also pointing out just how difficult the Christian life will be. In the field of law, we have a doctrine called stare decisis. It means that once a case has been decided a certain way, future cases that present similar facts should generally be decided the same way. The doctrine allows for consistency (the hobgoblin of small minds), predictability and promotes a certain sense of fairness. We apply a similar practice in our own lives. Each of us have developed a habit, a rubric, for dealing with telemarketers, panhandlers on the street, or older people who corner us to talk about their aches and pains. We have a formula for how we deal with the coworker who stops by our desk to talk about their family problems. These rubrics, these habits, offer us a certain level of efficiency. But they may also pose a danger to our spiritual lives because they prevent us from having to think about individual situations or feel compassion when confronted with a unique situation. The great German philosopher Martin Heidegger called this “unreflective everydayness.” I think, in part, that’s what Jesus was warning us about in the Parable of the Bridegroom. By relying on our preprogrammed responses, we miss the opportunity to see the face of Christ in those around us, and perhaps, to be the face of Christ for them. I do not know how often God intervenes in the world around us, but I suspect it’s a lot more than most of us realize. Christ’s advice “Keep awake” may well offer the best cure for the spiritual doldrums that obfuscate God’s presence in the world. This entry was posted in Uncategorized and tagged Anglican, Bible, Disciple, Christianity, Dominican, Ferris Bueller, God's presence, Heidegger, Living in the Present, Parable of the Bridegroom, Pastoral Care, Spirituality. Bookmark the permalink. Setting the gramatical issues aside, I think you’re absolutely right. Even our spiritual practices can become stale habits, and it’s our great challenge to seek to constantly renew them through vigilance, compassion and mostly, praying for God’s grace to redeem our efforts which are too often too feeble. As always, thank you.